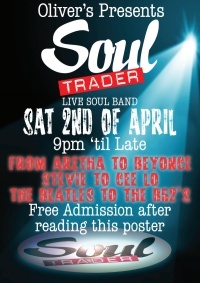 Soul Trader Public Gigs and Live Entertainment all Occasions including Conference Events, Company Function, Birthday Party, in the Midlands. The proof of our fabulous music is in the performance we give, so why not take a listen to just some of our extensive playlist. You can find Soul Trader on many of the most popular social networks and media channels. Pay us a visit and become friends of the band. We'll look forward to seeing you. Looking to book a live Soul Band? Available for all occasions, Weddings / Conference Events / Company Function Occasions / Birthday Party ? in fact any live entertainment then you've come to the right place. The band is based in Worcestershire in the Midlands, but we can and do travel all over the country. Book us and we'll be there. 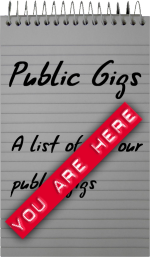 If you would like to come and see some live entertainment and see us play then check out the Soul Trader public shown on our gig list below. Tickets are often required for these gigs so click on the venue for relevant contact details.If you are thinking about booking Soul Trader for a gig please contact one of the band members with your request via the Drop Us A Line link. Please remember that we have many private gigs booked throughout the year and we would urge you to give as much notice as possible to avoid disappointment. Saturday, 2nd April, Oliver's, Malvern. 9.00pm til late, free admission.! Vist the Soul Trader BLOG where you can find all the latest news direct from band members. A great way to get to know our soulful band. Take a look at letters sent to Soul Trader from happy revellers.